Occasionally emotes positive things at you, "Alliance Enthusiast admires you", "Alliance Enthusiast draws your name in a heart", "Alliance Enthusiast cheers for you!" 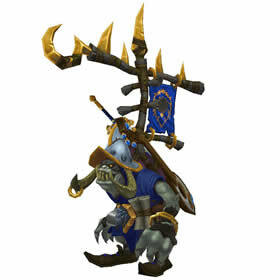 Upon reaching Honor Level 20, Alliance characters are rewarded with this companion pet. Players that have unlocked this PVP reward can use a max level Horde character to purchase the opposing faction's equivalent pet for 500 gold. Thanks for confirming this. I had started doing the free world quest as a PvP quest on one of my alts that gets the free world quest each day and was starting to wonder if I was wasting my time doing that. As of Patch 7.3... Players that have earned a Prestige companion on one faction can now purchase the companion of the same rank on the opposing faction. Requires you get to New Dalaran, speak to the PvP vendor and buy for 500 gold. If you are a class that has the once-a-day-free-wq class hall ability, you can have this pet in about 2 months without leaving your class hall. There is 1 pvp wq every day that rewards 500 honor, that's the one you want to get. This is one of the best PVP tanking pets in the game. JOSL will slow the enemy by 50% and reduce their damage by 50%, which is huge. You can then use Dodge which will allow you to block attacks for 2 rounds. Humanoid racial = 61 health per turn (when attacking). It doesn't show in the journal or on the picture here, but he also has a load of bones and a skull hanging from the banner poles. A very cool-looking pet. If you do ONLY the PvP WQ's you'll get this guy in only a couple of short months...Heck,many of the PvP WQ's don't even require you to interact or even encounter actual players-just farm the WQ's and GL. Well worth the effort! Does anyone know if the prestige pets will remain on your account if you faction transfer the toon you got them on? "Alliance Enthusiast cheers for you!" ...and other fun ones. He will also give you good advice in pvp games. Speaking with people, it seems the easiest way to get prestige is simply doing all the pvp WQs everyday. That should net you 1000-1500 honor a day with little effort. Then you can multiply/divide to see how long it takes. You can do ally+horde at same time and you should get both pets roughly at the same time. GL! @Ringo - No, the pets are not shared. You will have to prestige (reach Honor Level 50) twice if you want both of the pets: once on an Alliance character and again on a Horde character. Do the enthusiasts, by any chance, interact when they encounter each other? And does getting one via the prestige system automatically award the other? Welp. Looks like Imma gonna have to start pvp'ing again for this guy. And the Horde equivilent as well. Maybe a bit too enthusiastic.